CALGARY — Mike Smith pumped his fist after a 31-save shutout for the Calgary Flames in a 2-0 win over the visiting Minnesota Wild on Thursday. Calgary's goaltender earned his second shutout of the season, the 38th of his career, and improved to 5-0 in his last five appearances. "That's the only time of the game I can celebrate, is when we win the game," Smith said. "It's always nice, especially in a close game to hear the horn go off at the end and get the two points. "I could honestly care less about the shutout. It's just a bonus, but I'm more celebrating because that's the only time I can in a game." Elias Lindholm scored twice for his 14th goal and 15th goals of the season. The Swede has 32 points in 29 games in his first season as a Flame. His career season-high is 17 goals for the Carolina Hurricanes in 2014-15. Johnny Gaudreau and Calgary captain Mark Giordano assisted on both Lindholm goals Thursday. Calgary topped the Pacific Division at 18-9-2 and improved to 13-2 this season when scoring the first goal of the game. The Flames are at home to the Nashville Predators on Saturday. Minnesota (15-11-2) dropped to 1-2 on a road trip in which the Wild face five different Canadian teams in a row for the first time in franchise history. Minnesota is in Edmonton on Friday. 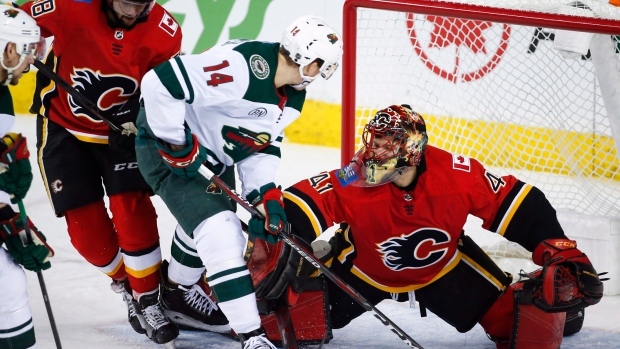 Wild starting goaltender Alex Stalock stopped 18 shots in the loss. "I thought we were sloppy," Minnesota head coach Bruce Boudreau said. "Right from the get-go they had two really good chances in the first five minutes. "I always think for the most part the effort was there, but a lot of our guys weren't handling the puck well. Alex played a really good game and kept us in there, especially at the beginning." The Flames had rallied for a 9-6 win in Columbus on Tuesday when Calgary trailed the Blue Jackets 4-1 early in the second period. Smith relieved David Rittich after one period and stopped 13 shots in the win in Columbus. Smith held off Minnesota on a pair of power-play chances in the second period and another to end Thursday's game when the Wild had two attackers with an empty net. Smith got his shoulder on a point-blank shot from Minnesota's Matt Dumba, the top-scoring defenceman in the NHL, during a second-period power-play for a key stop in the game. "I think the guys have bailed me out a lot this year so I think it's nice to make some saves and contribute on the team's success," the 36-year-old veteran said. Smith checked Wild leading goal scorer Zach Parise in the second period when the goalie came out of his net to play the puck. Dumba steamrolled Calgary centre Mikael Backlund in the final minute of the game. Flames forward Ryan Lomberg went after Dumba, which resulted in a Calgary penalty. "I think it's showing no respect for the player and for the game," Lindholm said of the Dumba check. "They're down two nothing and there's 40 seconds left and I thought he left his feet a little." Lindholm scored at 1:13 of the third period and 50 seconds into the second. Minnesota won a first-period challenge of a Lindholm goal that was ruled offside. Notes: With two assists, Giordano reached 407 career points and moved past Lanny McDonald into 11th on Calgary's all-time list . . . Flames forward Michael Frolik (lower body) and defenceman Michael Stone (blood clot) and Juusu Valimaki (lower body) were scratched from the Flames lineup.